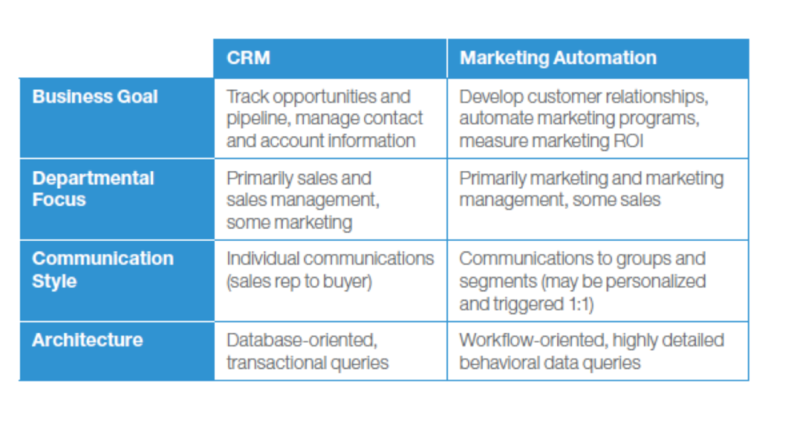 If you are new to the CRM + marketing automation game, you and others in your sales and marketing department may find yourselves asking, “We already use a CRM- why do we need to use another tool?” While marketing automation works closely with your existing CRM, it is important to note they are not one in the same. CRMs are a wonderful tool to track new and existing customer touches and interactions, but it is not a one-stop shop for hitting your sales goals. Adding marketing automation into the mix can give your teams the boost needed to land your organization in revenue paradise. Used by the sales team. Primarily a DATABASE used to store every bit of information on your customers. Assists the sales rep in managing personal interactions with customers. CRMs can remind the sales rep when calls are scheduled or even when the customers birthday is approaching. Used by the marketing team. Master execution tool. Not only can your marketing automation tool streamline and schedule communications for your leads, but it can also personalize emails based on the current situation or status of the individual lead. Lead behavior based scoring and outreach. Did your lead click a link in an email or visit a key webpage? Great. Now you can award points and/or send a message with more information. Tracks ROI for campaigns. Post campaign analytics in your tool can make proving the value of marketing initiatives as easy as a click. Your CRM has great information and so does your marketing automation platform. The two tools not speaking to one another would be a major disservice to your organization. Be sure to think integration. Does the CRM you have link well with the marketing automation software you have in mind? If this is a mystery to you- no worries – Leadous can help your organization can get the two working together like peanut butter and jelly.